As a Christmas present, my sister and I decided to go to a dinner at Goat Lady Dairy together with our husbands, instead of buying gifts. My sister and her husband had never been, while Vee and I had only been once before in May. We started off with an (unpictured) appetizer on the porch: Giacomo’s Salami Toscana with Smoked Sweet Potato Mousse and Caramelized Sage Onions. It was really interesting; I never would have thought to put sweet potato and salami together, but it worked really well. After a few appetizers, we took a tour of the farm where the owner, Steve Tate, explained that it was breeding season for the goats. He said they set up a buck in a pen by himself to um (ahem) get the doe’s in the mood…. he is appropriately called the Teaser. I tried to take a picture of him when we first got there before the tour, but he was stomping around like he was mad, so I didn’t take the picture. Little did I know why he was mad at the time! My sister got to the farm before me and said he was talking to her and told her his name was Billy. I think what he was really saying to her was “Hey baby, what’s yo name?” The sound they make sounds like Chewbacca! After the tour we went inside to enjoy the company and our meal, which was prepared by Chef Scott Carter. Everything was delicious as expected. If you are in the Greensboro, NC area, I encourage you to experience dinner at the dairy! Their 2012 dinner dates are ready for reservations! Goat Lady Dairy is also offering a new casual dining event called Sunday Supper. It includes a tour of the farm and a three course buffet. You can read about my first experience at the dairy here. Like I was saying, after Owen’s Bagel & Deli, we headed to the Atherton Market across the street. 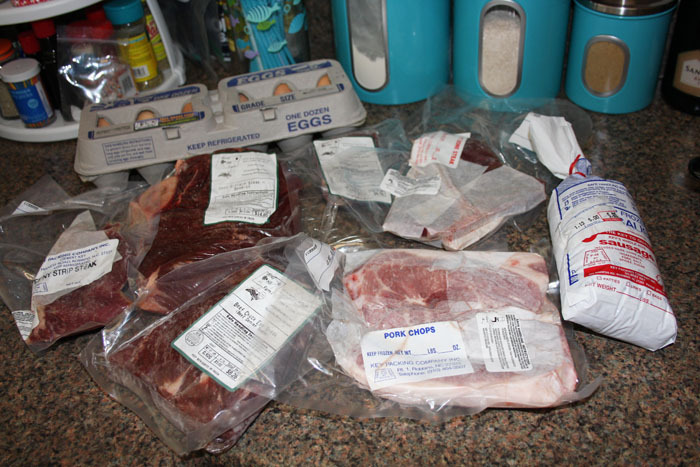 Our main reason for going was to pick up some items that I ordered from Windy Hill Farm. Windy Hill Farm is based in New London, NC and they humanely raise their animals without the use of hormones or antibiotics. They sell pork, lamb, beef, chicken, and eggs. You can usually buy their products from the Atherton Market & Mill and the Yorkmont Farmers Market. The cool thing about Windy Hill Farm is that you can pre-order on their website and pick it up at one of the markets on Saturday. Or, you can pick up your order through the week at various other locations through the Buyers Club Pickups. They currently have pickups in Salisbury, Lake Norman, Concord Mills, and Albemarle. If that’s not convenient enough, then I don’t know what is. And yes, the greens are resting on a Dunkin Donuts box. I also tasted the best Italian Ice in my life from The Frozen Melon. Seriously, it was life changing. I had the cantaloupe ice. Now, this is the definition of refreshing. Next on my list to try, is the tangerine! When I got home, I made a salad with the greens I bought and added some Lavender and Fennel Goat Cheese that I found at Earth Fare. I think most of my friends are aware of the goat cheese obsession I have and some (ahem, Vee) think I need an intervention. You can’t stop me! I topped the salad off with a Windy Hill Farm Fresh Egg! You can always tell a farm fresh egg from a store-bought egg because the yolks always seem to be more orange than yellow. Mmmm, get thee to the market. Community Supported Agriculture (CSA) is a way to support your local farmers and in return receive fresh local produce. Most farms have CSA sign ups by the season. You pay a fee for let’s say, 10 weeks, and you receive a share of what is harvested, usually once every week for that 10 weeks. I received my last CSA share from Barbee Farms this week. I have been signed up with them since this summer and loved the experience. They do have a winter CSA, but I decided not to sign up due to the Holiday scheduling. I hope to sign up with them again in the spring. Until then, I will make my way to the Atherton Market when I can. 1. I was getting tired of waking up early on Saturday morning to make it to the Farmers’ Markets. As much as I wish I was, I am totally not a morning person! By the way, this was before I saw the documentary Food Inc. > I had been trying to incorporate more fresh produce in my diet, but I always found that the produce in the grocery stores never looked that fresh and actually didn’t even taste that great either. Of course some of it is okay and is still better than any other packaged food in the store. I was just a little disappointed in the quality. This is when I determined that I would try to buy my produce from Farmers’ Markets where I knew it would be fresh and tasted way better. The truth is, that local produce hasn’t traveled across the country and lost half of its nutrients before it reaches you and also hasn’t been picked before its ripe. 2. Then I saw the documentary Food Inc. and found out that most Farms offer CSAs. I never knew such a thing existed. This was great news for several reasons. It meant that I could have my Saturday mornings back to sleep in. I wanted to be sure that I had access to fresh local produce every week and usually CSA pickups are during the week in the evening. 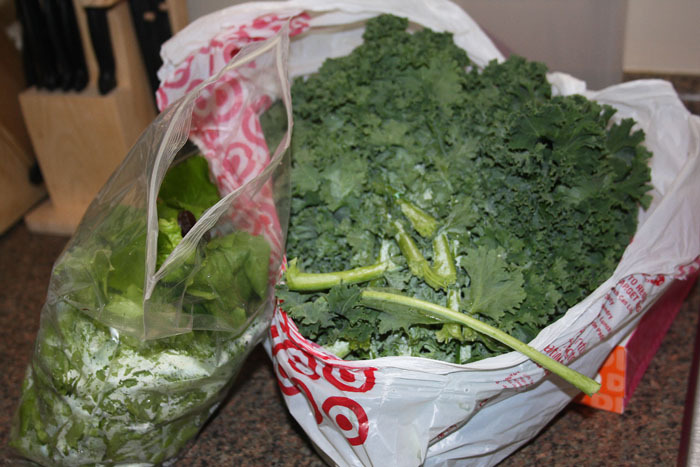 I picked up my Barbee Farms CSA on Thursdays between 3 – 7pm. Perfect! More importantly, I was helping out a local business. 3. I decided that signing up for a CSA would be a challenge. You don’t get to choose what veggies and fruit you will get in your share. You take what they give you; whatever was harvested that week. I found myself always buying the same “safe” produce at the Farmers’ Markets. Produce that I had eaten many times before. I was a bit intimidated to try new things because I didn’t know how to cook or prepare it or if I would even like the way it tasted. I knew the CSA share would push me out of my box and make me try new things. I actually enjoyed finding new items in my box and searching the web or cookbooks for ways to prepare them. There are many more benefits to joining a local CSA. Please read Agrigirl’s Top 10 Reasons to join a CSA. Visit Eat Wild to find local farms in your area. Fall is my favorite season. It always has an eerie feel: the fiery leaves, the chilly wind, the days getting dark earlier, and the scary movie marathons on TV. Ghostbusters, Hocus Pocus, Beetlejuice, 28 Weeks Later…….28 Weeks Later scared the crap out of me, but I can’t help but watch it when it comes on TV. Those zombies run fast, man! Growing up, the best part of Fall was Halloween. I loved dressing up and getting tons of candy to rot my teeth. I was a witch many times, and a mouse, a pirate, dead cheerleader, cat, and that’s all I can remember. This year, I was a dead girl from the 60’s. The dress was my Granny’s, which probably was from the 60’s or 70’s. Other cool things about Fall are the pumpkins. This little guy came in my Barbee Farms CSA box. I learned from their weekly email that decorative pumpkins are not usually meant to be eaten because they are tasteless. This pumpkin, however, is a “pie” pumpkin and it is grown to be eaten. Did you know that? I didn’t. Vee’s sister Christie came to visit this week. She had to fly out of Charlotte for a business trip and decided to spend the night with us! Christie is super cool and I love hanging out with her. She is also a yoga instructor and has the perfect chillax voice for it. I cooked dinner that night and our appetizer was Zucchini Muffins with Chocolate Chips!! It really should have been dessert, but who cares! We can do what we want! They were yumsy in my tumsy. We make our own rules! I made a loaf without chocolate chips as well. For dinner we had salad, pasta, sprite melon, and oven roasted corn and eggplant. The bell pepper, corn, eggplant, and sprite melon came from Barbee Farms. Have you ever heard of a sprite melon? This was my first time eating one. It is a type of Asian melon and is similar to a cantaloupe. It taste like a cantaloupe except it is super sweet and is a little crispier and firmer. This recipe is adapted from allrecipes.com. Mix in oil, applesauce, and sugar. In a separate bowl, mix flour, cinnamon, nutmeg, baking soda, baking powder, and salt. Stir in the flour mixture with the rest of the ingredients. Pour half of the batter in an 8×4 inch loaf pan. Mix the chocolate chips into the remaining batter and spoon into a muffin pan. Bake muffins for 30 minutes and loaf for 60 minutes at 325. This recipe will make 2- 8×4 loafs or 24 muffins. 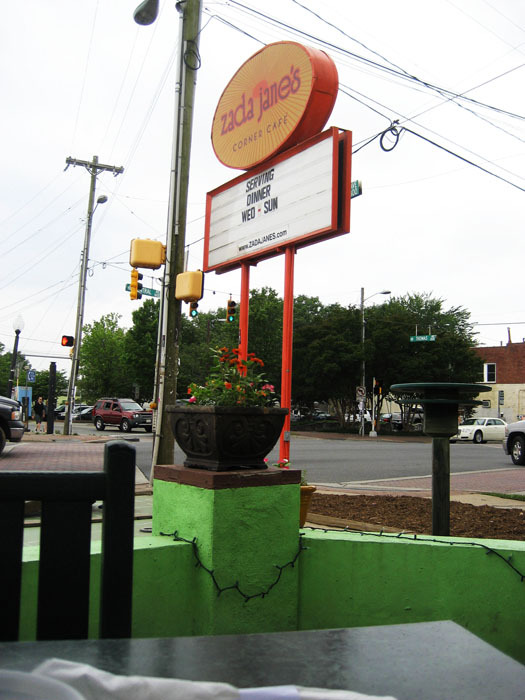 If you are ever in the Charlotte area, I encourage you to spend a day exploring Plaza Midwood. It is a fun and eclectic neighborhood with unique shops and restaurants. First, you can choose to eat at two of my favorite places: Zada Jane’s or The Dish. Zada Jane’s has an awesome breakfast menu with the option to get Grateful Growers Farm sausage. It is a $1 extra, but you would be supporting local and you can rest easy knowing it contains no hormones or antibiotics, so just do it! My breakfast was so delicious that I forgot to take a picture before I finished it all. I had a chance to take a picture of Vee’s though, because he is a slow eater! If you are not feeling breakfast, head across the street to The Dish for some good ol’ homestyle cookin. They serve Pot Roast, Cajun Meatloaf, and Chicken & Dumplings to name a few and most plates come with a devilled egg on the side. One of my favorite items to get is the Spinach and Portobello Quesadilla. One other eating option that I do not have a picture of is The Penguin. They serve some mean juicy burgers and fried pickles!!! Plaza Midwood also has few antique shops. I got two cute little Pyrex Refrigerator Dishes from 1510 Antiques. Also check out Hong Kong before you leave the area. They have awesome vintage clothes for men and women; even cute dresses like this! There are many more unique and fun stores in this area to check out other than the ones I mentioned. These were just a few of my favs. I hope you enjoy a Plaza Midwood Day soon!